Planning ahead? Love a bargain? Amazon is currently discounting all paperback mysteries from Berkley, Obsidian & Signet (all part of Penguin) by 10% — including pre-orders on Death al Dente. So pop on over and place your pre-order now—which will give you plenty of time to plan how to spend the 80 cents you save! Seriously, pre-orders are hugely important—especially to new authors like me—because publishers use them to gauge which books are more likely to succeed, and give those books an extra boost. So if you place a pre-order, Ruff the Cat (seen at left, disguised as Mr. Sandburg) will be eternally grateful. 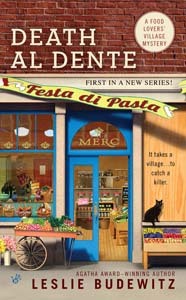 This entry was posted in Food Lovers' Village Mysteries and tagged Death al Dente, Mr. Sandburg, pre-orders, Ruff by Leslie Budewitz. Bookmark the permalink. Done!!! Thank you for the heads up.